PuzzleMad: Is it Easy? Hell No! Is it Easy? Hell No! This week has been my first annual leave after my operation in November. I think that leaving it 5 months without having any time off is too long! I was all set for a rest but it was not to be. "We" had been discussing the terrible state of my study for a while and "we" had decided that enough was enough and it was time to do something about it! With visions of a huge bonfire in my garden, with a slight tremor in my voice, I asked what she intended as a solution? 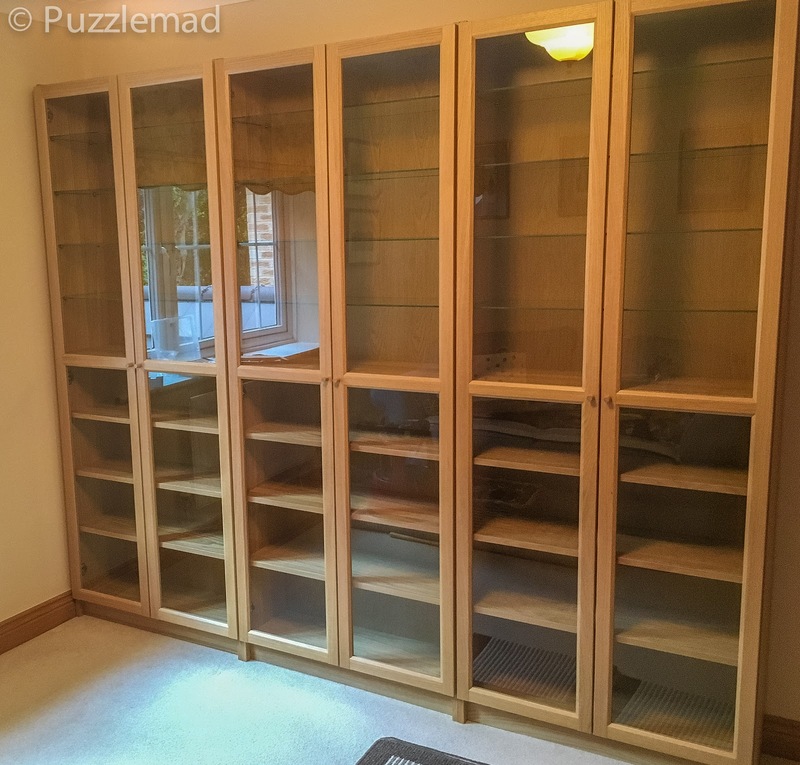 Ikea had opened a store in Sheffield last year and Mrs S had decided that one of our spare rooms could be used for puzzle display. Yay!!! You can see why she was upset! The small stretch of visible desk is to allow the cats to jump down from the windowsill. The weekend before my annual leave we had a trip to the shop and navigated hundreds of screaming children before I discovered to my horror that Ikea is also known as "storage central"! 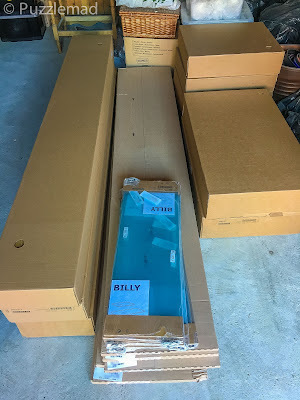 We duly ordered some Billy bookcases with doors and extra glass shelves to be delivered (they would never fit in my Mini) and much to my disgust, she homed in on the chests of drawers, other items called Skubs and various items of storage. Another 6 chests were added to the delivery along with assorted other stuff and the following day a delivery occurred (yes, on a Sunday). The garage was even more of a mess after that! That's a whole lotta flatpack! Some of my most prized beauties go in first. 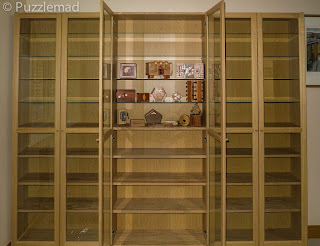 After the puzzle cabinets were constructed it was on to the rest of her storage purchases. As a result, the desk is still a mess and I am about to go back to work! My physical fitness and strength have, however, improved a lot! Back to the puzzling! Not only was the DIY much harder than I expected, but the puzzle for this week was also MUCH tougher than I first thought. At the top of the post is the Son-mum cube made by MF8. The original design was by Mike Armbrust as the Shallow Mixup Cube. My copy was purchased from the HKNowstore (it is also available in N America from Puzzlemaster). 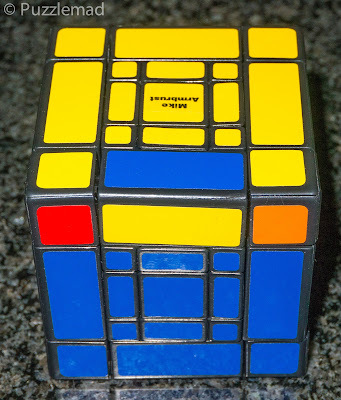 I couldn't resist it because my experiences over the last couple of years with various Mixup cubes has been really good - they are amongst my favourite twisty puzzles. 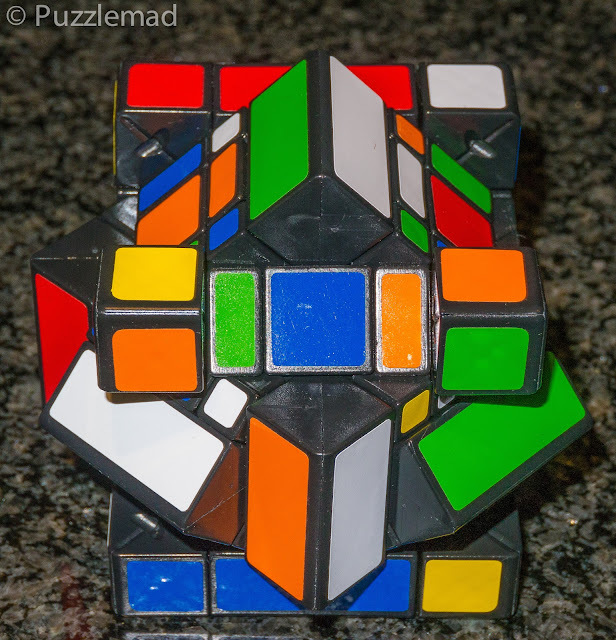 As with the other Mixup puzzles they are special because of their ability to have the centre row and columns turn 45º and yet still allow the other faces to turn. This allows edges and centres to be interchanged which becomes quite confusing and also allows some wild shapeshifting. The first attempt was fun! I quickly managed to return it to cube shape and found the bandaging to be fairly easy to get past. 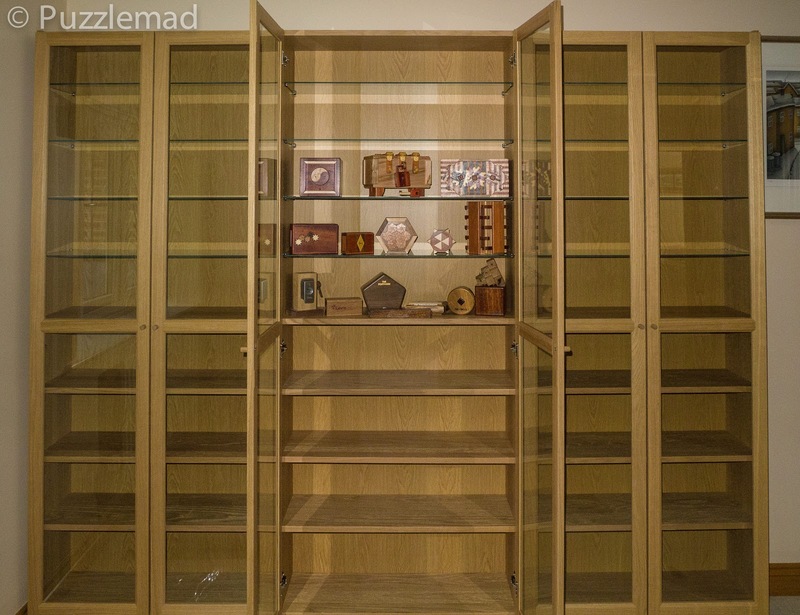 After that, a straightforward hunt to recreate the centres also proved to be a very easy challenge once I had seen the secret of moving pieces about. No algorithms were required at all! Just very simple intuitive moves. Having recreated the centres and it was just a quick 3x3 solve and I was done! Fantastic! It had only taken me about an hour for that first solve - easy peasy! A single flipped edge is not usually possible. Time to engage the little grey cells (the few that haven't been pickled in gin yet). I recalled the original Mixup cube and after about half an hour of fiddling about (one day I will start to take notes on my puzzle solution methods so that I remember techniques used in the past). 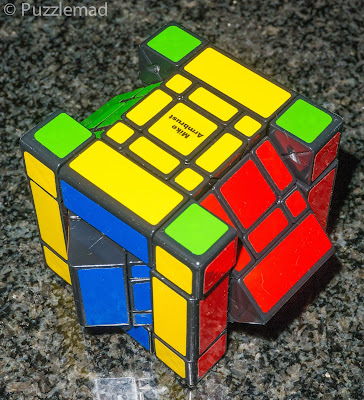 Eventually, I worked out a nice simple set of moves (hardly complex enough to be called an algorithm) which fixed the flipped edge, then another 3x3 solution and it was done - easy peasy? A little less so but not too bad. Not being very bright is a major shortcoming for me! I should have stopped there but no...I had to do it again. I hit a brick wall! I seemed to be completely unable to return it to cube shape! The outer centre pieces were not lying flat and for some reason, there were only 6 of them sticking out. Had there been 8 then I could have lined them up and done an equatorial ¼ turn and had everything flat again with just the edges and very centres to swap. But with 6 of these pieces sticking out, I could not simply flatten them. I began to sweat and mutter under my breath! Again and again and again I failed! Suddenly after a couple of hours...aha! I now knew how to create and move them about. Still no algorithms needed...just fiddling about until things were right. The rest of the solution progressed without any parities and I breathed a sigh of relief! 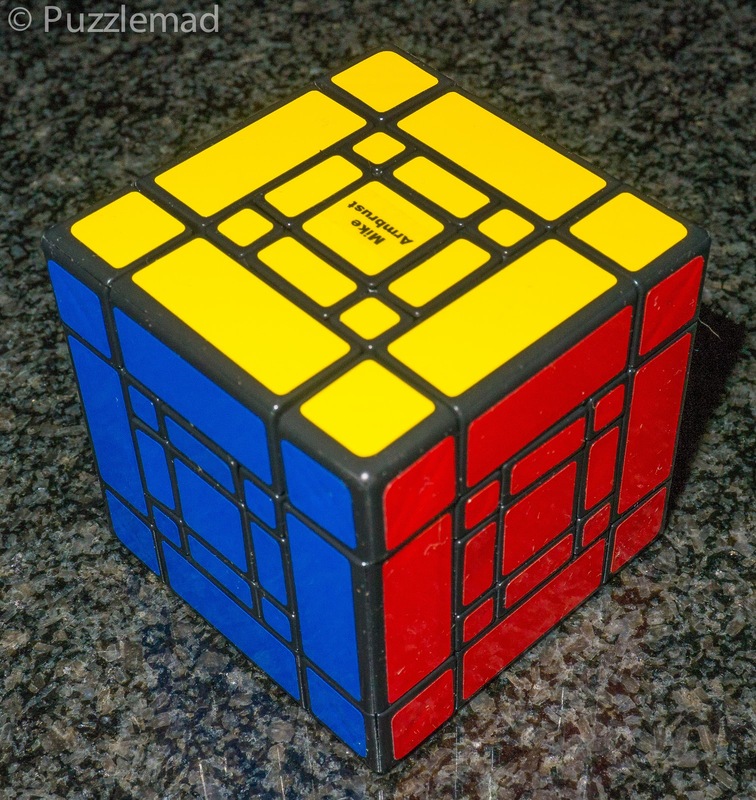 These 2 pictures are an equivalent parity...both are impossible in a standard 3x3. 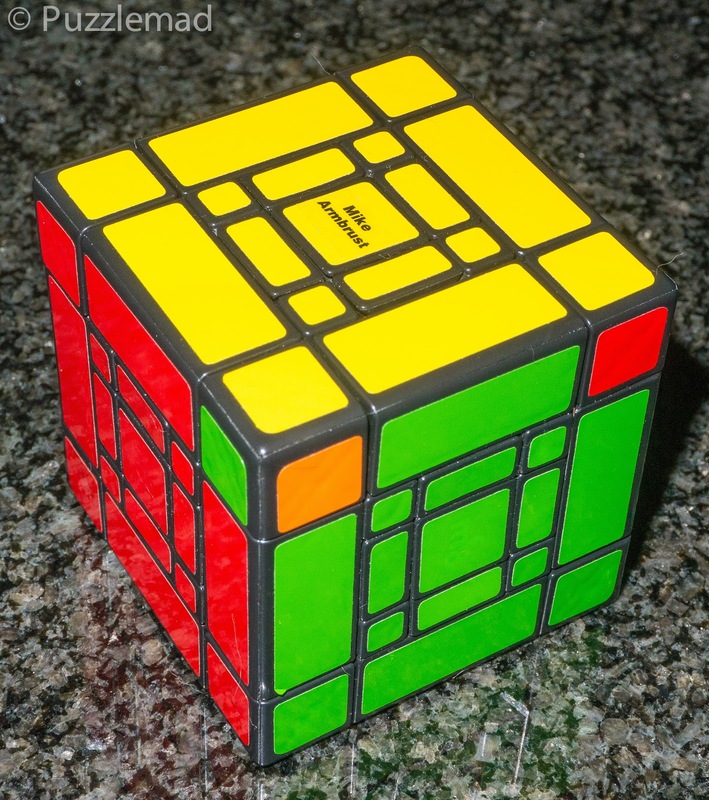 It is usually impossible to have 2 corners or 2 edges swapped. This parity occurred for the first time and caught me by surprise - I had no idea such a thing was possible. I was stumped! I thought that it must have been either due to the centres being recreated the wrong way or possibly due to the whole equator having ALL the edges and centres swapped but how to fix it? I tried everything I could think of until after 2 or 3 days and about 6 hours of attempts, I found a method. It certainly is not a pretty technique and I am not entirely sure why it works but I think it rotates all the equatorial edges and centres by 180º. With a huge sigh of relief, I can now put this one down. 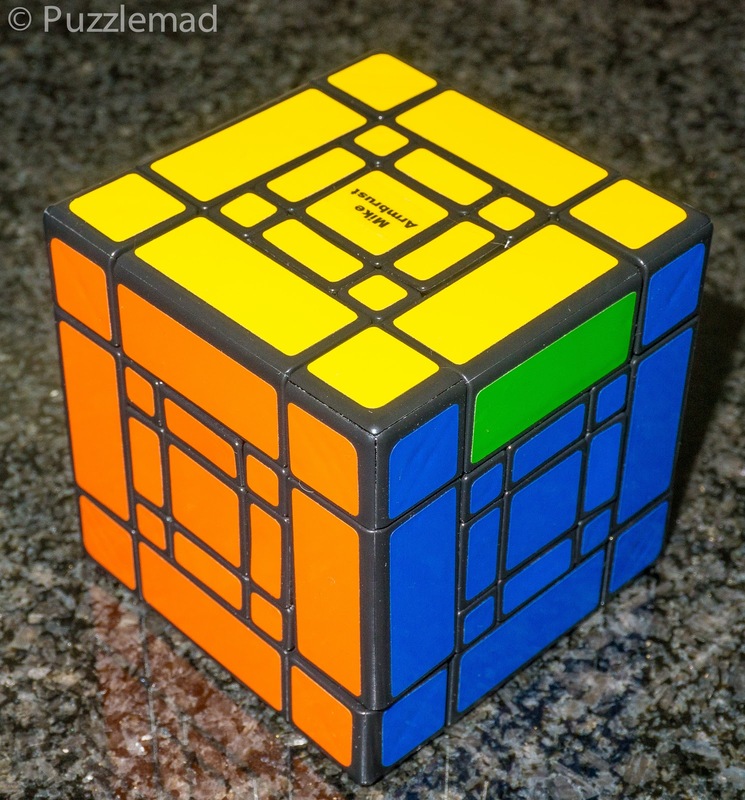 Should you buy the Son-mum cube? Not if you are a beginner! If you have been playing with twisty puzzles for a while and have some experience of the Mixup cubes then definitely buy one of these. They move well and are fun to work out the basics. That killer parity may require some help and I have seen that there is a thread on the Twisty Puzzles forum about it already. Tomorrow it will be back to work for a rest! 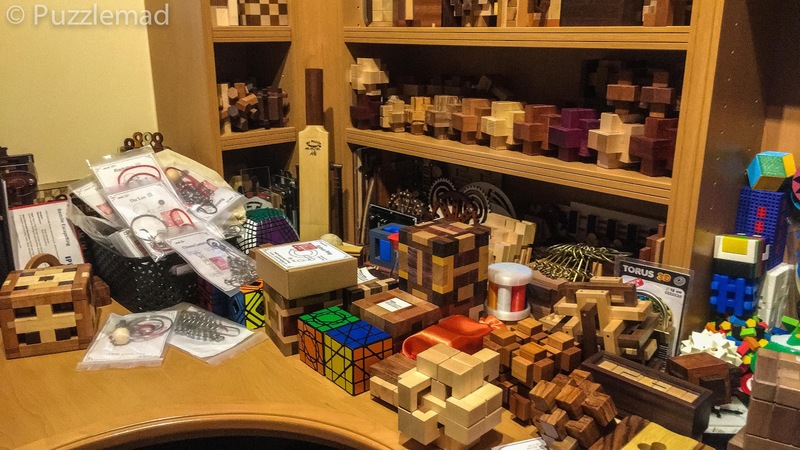 Good luck getting your desk puzzles all sorted into your new puzzle cave Kevin! 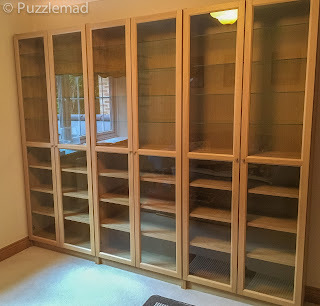 With all that extra space I am sure you will be able to fit quite a few new puzzles in there... one less excuse for Mrs. S. of why you shouldn't buy any more of them! That twisty looks absolutely horrific (and I thought the traditional 4 by 4 was hard). One of these days I might have to delve a bit further into my understanding of the dark realm of twisties. By the way (sort of off topic) I have noticed that even after a long time of it being available still no bloggers have reviewed the cast trinity yet. Have you had any success on it? Yes this new space should keep me going for a while! I was never going to stop buying them anyway but now I have somewhere to put them. You really should carry on with the twisty experience. They are a great challenge and not too expensive plus they have great repeatability. Look at my advice for beginners post to decide where to go next. The Cast Trinity has so far got me beaten. I think quite a lot of people are struggling with it. I did the cast trinity. There is one AMAZING move near the end of the solve. You'll know it when you find it. So cool!